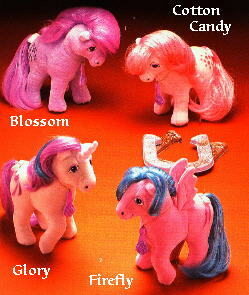 Lofty's Plush Paradise Applause Page- Featuring Hasbro Softies and other plush My Little Ponies! 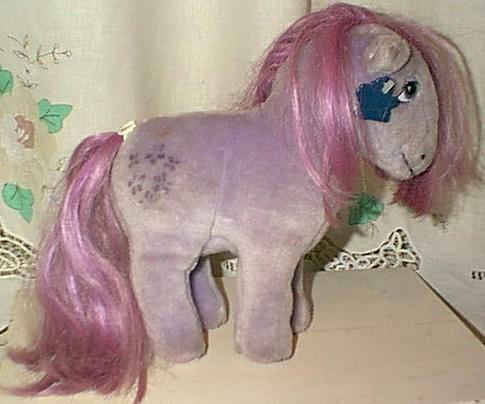 In 1984 Applause made a version of the plush ponies for Hasbro. They are different from the Hasbro plushes because they have strange looking faces and the colors and symbols are variants of the originals. They also had bows sewn into their tails and each came with a flower brush tied around their necks. Applause ® Division of Russ Berrie & Co., Inc. Woodland Hills, CA © 1984 Hasbro Industries, Inc. Product of Korea. Reg. No.PA 2S (or 5)1 Ohio Lic. 6905 (CA). Lists the Contents, and Item No. 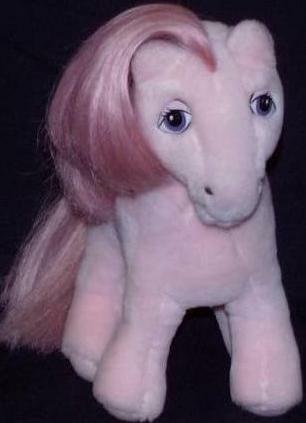 2385 My Little Pony ™. 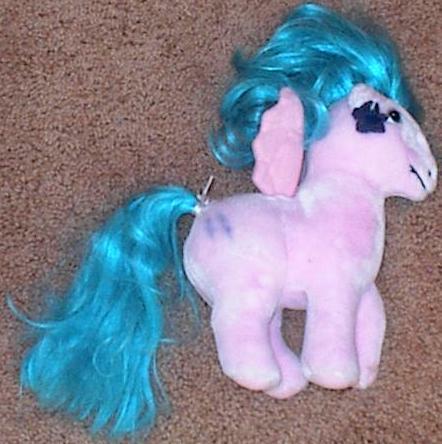 They also had either a purple plastic star attached to their ears or a pink plastic heart near their tails. 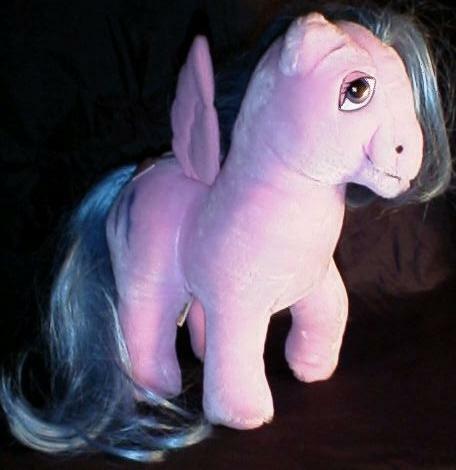 My Little Pony 1993 Hasbro Industries Inc.
1 Blossom/ Cotton Candy 2380-10"
Every boy and girl wants a pony to call their own. 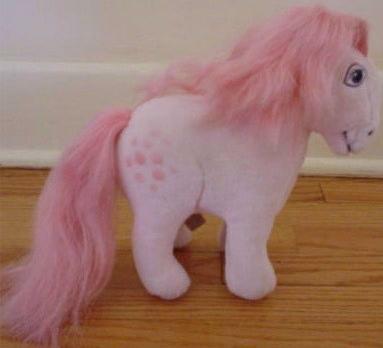 That's My Little Pony. Four very special, very popular little horses who've been advertised extensively on TV-and have won the hearts of children all over the country. 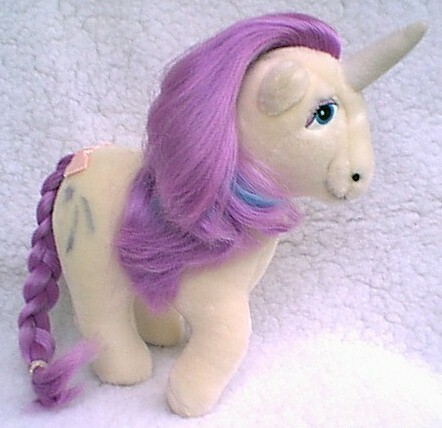 Kids love to comb their silky, colorful manes (brush included) and hug their soft, plush fur. Each has a personality-and story-of his own! With Blossom, Cotton Candy, Glory, and Firefly, your sales are sure to take off. Blossom is purple, but instead of white flowers, her symbol is purple. Cotton Candy is all pink, but her symbol is pink dots instead of white ones. 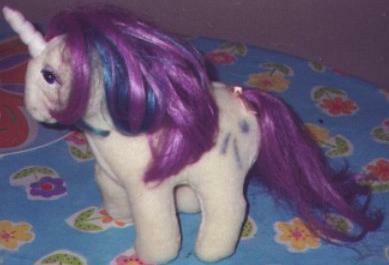 Glory is white with purple hair with a blue streak. 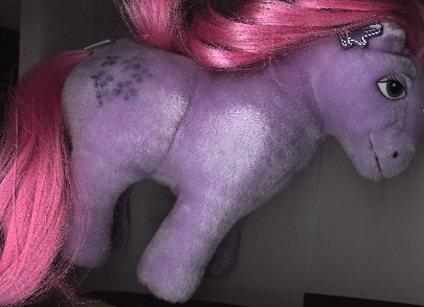 Her shooting star symbol is all purple.